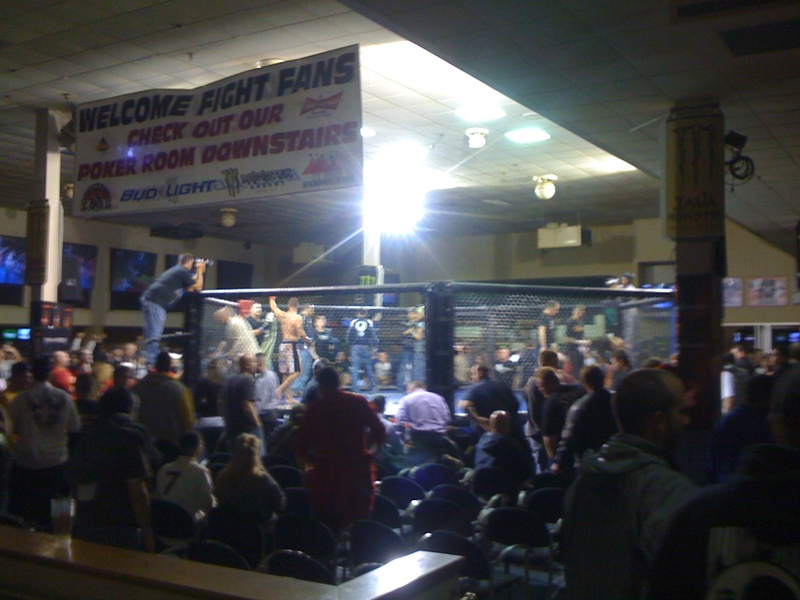 If I was going to attend my first Combat Zone MMA event, I couldn’t have covered a better one than Friday night in Salem, NH, at Rockingham Park. The venue fit perfectly and you can see why it’s become a home for Combat Zone. Part of a bigger entertainment complex, the cage is set up in a good size room that packs in plenty of standing room only folks, making for an intimate environment where you hear and see everything. Combined with the passion of fans and teammates cheering for fighters they personally know and train beside, this is what MMA fans that only are familiar with the UFC need to experience in person. The big shows are great, but this is where those stars start out. I’d never seen Benoit fight before, but there’s a reason he’s now 10-2 and it showed Friday. Clauss (7-4) was working him over on the ground, taking him down fairly easily and landing solid knees to Benoit’s legs in the first round. But somewhere along the way, Clauss caught a shot which opened up a big gash that may have bothered him mentally. Benoit looked great standing and showed off some nice kicks and combinations, but every time he got something going, Clauss would stuff it and take him down. Clauss’ cut never stopped bleeding, dripping like a leaky faucet on Benoit. At one point in the 2nd round, the referee stopped the fight and was seemingly looking for the doctor to check the cut. The doc never came in so the fight continued. In the 3rd, Benoit came out firing uppercuts and Clauss slunk for a takedown. Benoit held position and showed Clauss what he’s been learning at Renzo Gracie NH by sinking in a modified guillotine choke for the victory. Gutty performance that the crowd loved. I’m not sure what clipped Reeves, but he went down like a ton of bricks. Santiago pounced and landed enough unanswered strikes to stop the fight quickly. Santiago (1-0) had a huge following in his pro debut but is a short 185’er so long term, he might be best suited for 170. Reeves was a loose 185 and fell to 0-4 with the loss. Perhaps pro MMA isn’t for him. Ainsworth (0-1) looked good early on in this 150-pound catchweight fight, but faded quickly. Toussaint (2-1) was patient and kept working, eventually locking in a nice armbar for the win. Santos (0-4) owned the first round, clamping on a tight guillotine early that Lamb was able to survive. Lamb kept trying a weak spinning back fist in his pro debut that clearly wasn’t working. But Santos disappeared for the 2nd and 3rd rounds and Lamb (1-0) took advantage. The end came in the 3rd when Lamb got a takedown and showed off his ground and pound skills for the TKO win. Murphy (1-0) showed a ton of heart in his amateur debut as he looked nervous in the 1st round and couldn’t get off. But he figured out how to work through Caterino’s (1-1) reach and started throwing some strikes that his opponent had no answer for. The 3rd was Murphy’s best as he looked comfortable and was super aggressive, constantly working to earn the win. Two judges had it 29-28 Murphy while another had it 29-28 Caterino, which I couldn’t understand. If there was one guy that really stood out, it was Loycano, a 155’er with good size that came out to the Disturbed version of “Stone Cold” Steve Austin’s music. Win! This was Healey’s amateur debut and he never did get started. Loycano (2-0) threw enough submission attempts at Healey (0-1) in the first round to earn a 10-8 mark in my book, carrying that over to the 2nd round where he submitted Healey with a rear naked choke Hughes vs. Trigg-style. Grant (2-2) won a rather uneventful first round and then Trahan (6-4) showed up in the 2nd. He had a standing guillotine early, but Grant took it to the ground. That turned out to be a mistake and Trahan worked for an armbar from the bottom and locked it in for the tap. This was a great fight. Lenfert had a big crowd supporting him and they definitely let people know who they wanted to win. Sanchez took the first, grounding Lenfert and dropping some bombs. In the 2nd, Sanchez looked to establish early with strikes but Lambert came back and tried to submit Sanchez with a loose guillotine that was more body control than anything. But Lambert had another choke up his sleeve (is that possible?) as he got Sanchez’ back in the 3rd and patiently waited for the right opportunity to sink in a rear naked choke for the win. Lenfert won a big trophy for being the night’s top amateur fighter, but I’m not sure who voted for it. It was all Ahlquist (1-2) early, but San Antonio (3-1) was patient and got a guillotine from his back for the win. Lambert (1-0) steamrolled through Harney (2-2) in her amateur debut, getting a standing guillotine choke for the quick tap. The night’s opener was over fairly quickly as Blanchet (2-0) won with an armbar. Santos (2-4) looked a bit unsure on the ground and Blanchet took advantage. The first round of amateur fights are 100% unpredictable, especially in someone’s debut. If you get past the first three minutes, then technique and conditioning take over. Before that? All hell can break loose due to nerves and inexperience. Great fights to watch! The crowd was fantastic. They really helped make the event as they treated every fight like it was important. It helped that nearly every fight had a finish, which is rare on 11-fight MMA cards these days. Hip-hop was overwhelmingly the choice of entrance music with Eminem leading the way. Even DMX was overheard. Yes, someone still listens to DMX. I arrived at 7:45 pm for an 8 pm bell and had no problem parking (free!). I left with no issue and was on the highway home within five minutes of leaving the venue. You can’t ask for more than that. Next event is Friday, January 28th. Josh Nason is a New England-based freelance MMA journalist who has live event coverage experience, has written for FIGHT! Magazine and frequently does radio/podcast appearances. Follow him on Twitter, will ya? While the bright lights of the major MMA groups haven’t yet shone in New Hampshire, regional organizations continue to thrive in the Granite State. One of those reaping the benefits – Combat Zone MMA – roars back into action Friday night at Salem’s Rockingham Park for their 35th event. Yours truly will be on hand to cover the event with a full post-event writeup. While it’s not exactly Red Sox vs. Yankees, the event is headlined by Massachusetts native John Benoit (10-2) vs. New York native Don Carlo-Clauss (7-2) in a lightweight bout. The 11-fight card features four pro bouts and seven amateur contests. While it may be light on household names, regional events traditionally have enthusiastic crowds filled with families and friends from all camps, making for a unique and intimate environment. Benoit comes into Friday on a two-fight win streak, last submitting John Hersey via 1st round choke in September. The 27-year-old is a Renzo Gracie NH student and it shows with five career wins by submission.This will be his Combat Zone debut as he’s mainly competed for Mass.-based World Championship Fighting. Carlo-Clauss returns to Combat Zone for the first time in over two years. He also comes in on a two-fight win streak, albeit two split decisions. The 30-year old last competed in May. The co-main event features American Top Team member Will Santiago – making his professional debut after a 3-0 amateur record – against 0-3 Glenn Reeves at 185 pounds. Santiago isn’t the only talent making his pro debut as Lisbon, NH-native Nate Ainsworth jumps from the amateurs to take 1-1 Adam Toussaint. Ithaca, New York’s Derek Lamb also makes his pro debut against Derry, NH native Nicholas Santos who is looking for his first pro victory at 0-3. The lone female fight on the card features Shannon Harney vs. Heather Lambert. 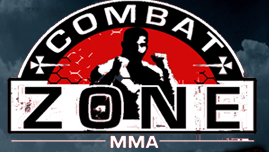 Combat Zone has been in business for years and have run solely in New Hampshire since the fall of 2008. The group already has dates established for their next three events following Friday night, showing stability and providing their fans with an immediate next event to plan for. Tickets are still available for the event with doors opening at 6:30 pm for an 8 pm bell time. Amateur bouts are three 3-minutes rounds, while the pros fight under traditional unified rules. With Combat Zone live Friday, Strikeforce Challengers on Showtime Friday and UFC 121 Saturday night, it’s going to be another MMA packed weekend. Josh Nason is a freelance journalist whose work has been published in FIGHT! Magazine, Bleacher Report, Manchester Magazine, WrestlingObserver.com and more. While MMA and email marketing are passions of his, he also writes on music, TV and life in general. Follow him at Twitter and check out his audio archive of appearances.